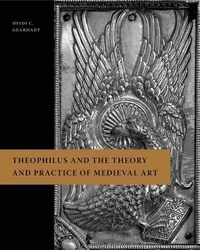 This recent scholarship is well complemented by Heidi Gearhart's Theophilus and the Theory and Practice of Medieval Art, a rich, thoughtful, and scrupulously researched reconsideration of On Diverse Arts and its intellectual, religious, and economic milieu. Working in the vein of Mary Carruthers, Bruno Reudenbach, and Conrad Rudolph, among others, and building on her doctoral dissertation on the topic, Gearhart argues that Theophilus's "fundamental project [...] is to define art as a learned and spiritual discipline" (12). On Diverse Arts, per Gearhart, is not the undertheorized, rhetorically inelegant craftsman's manual earlier scholarship had sometimes considered it to be, but rather an example of the venerable tradition of elite didactic literature, written by a monk exercising his acumen for an elite audience of "abbots, exegetes, and imperial patrons" (40), as well as the monastic community charged with the production of luxurious art (an institutional purview then being challenged by the twelfth-century rise of the secular artisan). Theophilus carefully positions artmaking as a virtuous labor: man, having lost his similitude to God but retaining his image, and therefore the potential for reason, may, through disciplined craft inspired by the Holy Spirit, overcome his fallen state and re-approach God's perfection. Making art therefore serves as "a vehicle for man's participation in God" (137). Gearhart aligns Theophilus not only with such familiar contemporaries as Hugh of St. Victor and Rupert of Deutz, but also with Augustine (contra Dodwell), from whom Theophilus's model of redemption through studied praxis ultimately derives. Gearhart's rigorous examination of the content, composition, and rhetoric of the text - see, for example, her discussion of Theophilus's use of the future perfect (72-73) - is matched, excitingly, by her physical examination of the early (pre-1300) Theophilus manuscripts themselves, including the two oldest witnesses, now at Wolfenbüttel and Vienna, which date to the mid-twelfth century. Gearhart's codicology is persuasive, and the sharp material contrast between these two manuscripts underlines her argument regarding the text's function and audience. The Vienna manuscript, the humbler and smaller of the two, may have actually been used in a monastic workshop: it is dirty and stained in places, it at one time lacked covers, and the three prologues are uncharacteristically grouped at the beginning of the text. The Wolfenbüttel manuscript, by contrast, is elegant and fine, destined for a library and focused contemplation. Here, the first quire of Theophilus immediately follows a mid-eleventh-century copy of Vitruvius's On Architecture, between which Gearhart detects, on the part of the manuscript's compiler, an intentionally staged thematic unity: the script, initials, ruling, and mise-en-page of the Theophilus strongly mimic those of the Vitruvius, and the visual coherence thus achieved grants each text equal dignity. Put one way, Vitruvius builds an architecture, and Theophilus fills it with liturgical art, thereby "completing" and "Christianizing" the Classical model (20). If Theophilus casts artistic labor as man's reconciliation with God, the work of art, in turn, serves as the physical proof: technique, skill, and process, discernibly evident in the finished object (via finely executed filigree or artfully developed vine scrolls, etc. ), now confirm God's grace. Gearhart, describing such "Theophilan viewing" (132-138), defines the work of art in terms of material and process, for which spectacular technique can compensate for a deficit of material value (notably, with a few significant exceptions, Theophilus rarely bothers to describe an image or iconography). Gearhart's fourth chapter, aptly titled "The Display of Skill," applies this model to a series of precious-metal objects produced in the early-twelfth-century ambit of Roger of Helmarshausen, for example the famed Portable Altar of Henry of Werl, which embodies a near summa of Theophilus's metalworking techniques, hierarchically disposed, with repoussé taking clear precedence over engraving and niello (112-113). Gearhart's visual analyses, such as her detection of three different hands at work on the nielloed verso plaques of the Enger Cross (116-119), remind us of the complicated workshop practices that reside behind any medieval artist, and also the standardizing role a memorized and practiced use of such a treatise as On Diverse Arts may have played. Gearhart easily navigates the complicated, and methodologically instructive, historiography of the identity of the pseudonymous Theophilus, who scholars agree was a Benedictine monk-priest, probably active near Cologne or Paderborn. The name "Rugerus" appears in the Vienna manuscript, from which Albert Ilg, in 1874, connected Theophilus with the goldsmith Roger of Helmarshausen, whose œuvre, which remains today contested, was first proposed a few decades later by Otto von Falke and Max Creutz. The Theophilus / Roger of Helmarshausen coupling, though not without skeptics, became widespread throughout the twentieth century, subject only recently to renewed scholarly scrutiny. Gearhart, while noting Theophilus's sympathy for metalwork over painting and glass, justifiably concludes that the sources cannot conclusively support the Roger of Helmarshausen hypothesis (5-7 and 93-105); Roger's metalwork, however, may still illustrate Theophilan viewing due to their shared geographic and cultural milieu. Key aspects of On Diverse Arts have been recently challenged by other scholars: a late-eleventh-century date has been floated, Theophilus has been tentatively identified as a Northungus of Hildesheim (who we know, quite fittingly, was a compiler of scientific and craft compendia), and the question has been raised of whether there ever existed a single, original On Diverse Arts, or whether it has always formed an unfixed and somewhat mutable compendium, a possibility Gearhart also entertains (130-131). Gearhart's argument should exist in dialogue with these approaches, many of which will cultivate their own critique. Throughout, Gearhart's contribution, in particular her physical examination of the manuscript witnesses, the convincingly argued textual analysis and historical contextualization, and her model of process-aware "Theophilan viewing," will challenge and orient, with authority, future approaches to both Theophilus and, more broadly, the medieval work of art. Because On Diverse Arts was often copied in parts, and not as a single, complete treatise, the count of the most significant manuscript witnesses varies in the literature; Gearhart identifies twenty-five (4-7). See: http://schedula.uni-koeln.de/ and Andreas Speer (Hg. ): Zwischen Kunsthandwerk und Kunst. Die 'Schedula diversarum artium', Berlin 2014. See for example the contributions of Andreas Speer, Ilya Dines, Patrizia Carmassi / Bertham Lesser, Stefanos Kroustallis, and Mark Clarke in: Andreas Speer (Hg. ): Zwischen Kunsthandwerk und Kunst. Die 'Schedula diversarum artium', Berlin 2014, XI-XXXIV, 3-10, 22-51, 52-71, 72-89.